What is the Best Degree of Hyaluronic Acid Crosslinking in Increasing Growth Factors Level of Platelet-Rich Fibrin Lysate? Introduction: Various therapeutic materials such as hyaluronic acid (HA) and platelet-rich fibrin lysate (PRF-L) have been represented to improve chronic fibroblast ulcers and premature aging. HA crosslinking is the most popular dermal filler presently in the therapy of aging skin. With the PRF-L properties that are rich in growth factors (GF), the combination of these materials is expected to produce synergistic and potentiation effects. Objective: This study aimed to determine the effect of various degrees of HA crosslinking on GF levels in PRF-L.
Materials and Methods: PRF-L was obtained from PRF of healthy adult venous blood with 72 hours of incubation. HA was taken from preparations with 3 crosslinking degrees of 3%, 4%, and 10%. Measurement of GF levels was performed using sandwich ELISA method. Results: The GF levels released in PRF-L increased with the addition of HA crosslinking. The lower HA crosslinking degree (3%) triggered greater release of GF by PRF-L compared to higher HA crosslinking degree (4% & 10%). Conclusion: Low degree HA crosslinking elevated all measured GF levels in PRF-L. The lower HA crosslinking degree provoked higher release of GF. Synthetic materials frequently utilized as fillers of aging skin tissue through injection include hyaluronic acid (HA). Hyaluronic acid is a glycosaminoglycan, a natural substance in the body comprised of disaccharide units. There are advantages and limitations of HA skin injections. HA is able to restore volume and elevate the amount of collagen in the dermis through fibroblast stimulation. This re-volumization also causes water retention at various levels, increasing turgor and skin hydration. However, HA is mere temporary in collagen and elastin volume replacement that continues to disappear and fail to make it revert . These HA preparations possess no durability properties when injected, so this HA gel material needs to be modified [2,3]. With crosslinking, HA will persist longer, for around 6 to 12 months. The optimal degree of HA crosslinking currently has not been identified. Very high crosslinking degrees were reported to potentially affect filler biocompatibility and lead to rejection or encapsulation [3,4]. In addition to the HA dermal filler, other aging skin therapies are using platelet-rich plasma (PRP) material. Recently, a simpler method has been developed to obtain platelet-rich material from peripheral blood, using platelet-rich fibrin (PRF). By using only single centrifugation, platelet lysates from PRF (PRF Lysate=PRF-L) can be obtained . It was proven that PRF-L was also affluent in growth factors (GF). Wirohadidjojo et al., reported that PRF-L was able to repair fibroblasts in aging skin due to exposure to ultraviolet-A (UVA) rays in vitro [6,7]. Dermal filler HA crosslinking has been utilized for longer than 15 years and is considered to be well tolerated. HA possess structural properties similar to the original tissue with decent tissue integration . The factors influencing the nature of HA as dermal filler preparation are concentration, crosslinking, cohesiveness and particle size . Naturally, HA that enters the body will be rapidly damaged by hyaluronidase with a half-life of about 12 hours and eliminated through the spleen system with hepatic metabolism to become carbon dioxide and water. It is very important to fabricate HA gel preparations that are durable after being injected. Crosslinking is a chemical process in which two or more molecules are joined by covalent bonds. The number of cross ties is reported as a percentage or degree. This shows the disaccharide ratio with crosslinkers in the formulation [2,9]. The combination of HA and GF derived from PRP has been published several times, both for the treatment of skin aging, and in the case of osteoarthritis . HA can be utilized as a scaffold in tissue techniques to provide three-dimensional templates to improve cell growth and GF supply . Combining HA filler with PRP can provide a synergistic effect, because HA acts as a scaffold and PRP is inducing collagen and generates fat cells. When injected in combination with conventional filler in animal models, this PRP exhibited both effects, namely the effect of augmentation and maintaining the effects of tissue volumization . This study aimed to determine the effect of HA mixture with various degrees of crosslinking on GF levels in PRF-L. This in vitro experimental study was conducted with a post-test control group design, at the Research Laboratory of Dermatology and Venereology Department, Faculty of Medicine, Gadjah Mada University, Yogyakarta, Indonesia. This study had obtained approval from the ethics committee of the Faculty of Medicine, Gadjah Mada University (Ref: KE/FK/0845/EC/2018). The inclusion criteria for PRF donors were healthy men over the age of 17 and willing to undergo venous blood withdrawal. The exclusion criteria for PRF donors were donors who consumed drugs influencing blood clotting. Consents from participants were obtained and legitimated by signing an informed consent. PRF-L sample was taken from venous blood of 1 healthy adult. PRF-L was a lysate obtained from PRF isolated from volunteer blood with 50% levels dissolved in Dulbecco’s minimal essential medium (DMEM) + fetal bovine serum (FBS) 1% (Gibco™, Massachusetts, USA) . tube, the supernatant was sucked and transferred into a 2 ml eppendorf tube and stored at -20º C until used. This supernatant was the platelet lysate. Crosslinked HA was obtained from dermal filler preparations (Teosyal®, Teoxane Laboratories, Switzerland) readily available from the market with 3 degrees of crosslinking (3%, 4%, 10%). Each HA was available in the form of a sterile gel in a 1 ml preparation in injection syringe. HA preparations were from Staphylococus equine bacterial fermentation (non-animal stabilized hyaluronic acid/NASHA). Mixtures of HA crosslinking (3%, 4%, 10%) with PRF-L 50% were made using the three-way connecting syringe method mixed repeatedly until homogeneous. The HA used in this combination was 30% preparation concentration in PRF-L. Comparison of HA and PRF-L was 0.3cc HA plus 0.7cc PRF-L. The measured GF were the ones closely related to the improvement of aging skin fibroblasts, namely transforming growth factor-β1 (TGF-β1), platelet-derived growth factor (PDGF-BB), and basic fibroblast growth factor (bFGF). Measurement of GF levels was performed using sandwich ELISA (Bio-Rad® Laboratories Ltd., California, USA) immediately following the combining of HA crosslinking and PRF-L. Samples were centrifuged for 20 minutes at 1,000 × g. The supernatant was collected and the assay was carried out based on the protocol provided by the producer of anti-GF antibodies (Cloud-Clone Corp®, Texas, USA). Optical density was measured at 450 nm. Measurement of GF levels was done by 3 times replication. The optical density obtained was then transformed to unit of pg/ml based on the standard solution curves of each GF. Data were processed with SPSS 21.0 (SPSS Inc., Chicago, USA) and presented descriptively in the form of mean + SD. As exhibited in Table 1, PRF-L with low degree HA crosslinking resulted in higher GF release. In PRF-L without HA crosslinking, the levels of TGF-β1 was 562.16±56.30 pg/ml, PDGF-BB 279.33±17.12 pg/ml, and bFGF 93.19±20.96 pg/ml. In group with low degree HA crosslinking (3%), the release of GF level was greater than the higher degree crosslinking groups (4% and 10%), with TGF-β1 level being 1178.63±159.17 pg/ml, PDGF-BB 356.24±36.84 pg/ml, and bFGF 121.05±15.68 pg/ml. As seen in Figure 1, low degree HA crosslinking elevated all GF levels compared to higher degree of crosslinking and without crosslinking. Table 1 Growth factor levels of PRF-L.
PRF-L with 4% HA crosslinking resulted in higher TGF-β1 release than the group without HA crosslinking, but lower than 3% HA crosslinking group, with TGF-β1 level of 881.92±84.89 pg/ml. For other GF levels in the 4% HA crosslinking group, all were lower than the group without HA crosslinking and 3% HA crosslinking, namely PDGF-BB 186.10±15.39 pg/ml, and bFGF 88.49±10.03 pg/ml. PRF-L with 10% HA crosslinking resulted in higher TGF-β1 release than without HA crosslinking, but lower than the HA crosslinking group of 3% and 4%, with TGF-β1 level being 803.04±52.07 pg/ml. For other GF levels in the 10% HA crosslinking group, PDGF-BB was at the lowest level out of entire groups at 174.26±49.29 pg/ml, and bFGF was the highest at 145.10±6.20 pg/ml. Figure 1: Growth factor levels of PRF-L.
Azyenela et al., proved that the addition of HA to PRF improved the ability of skin fibroblasts made senescence by the starvation method . The hypothesis in this study was that by adding HA crosslinking to PRF-L, there would be an elevated GF release in PRF-L. The lower crosslinking degree of HA, the greater the release of GF by PRF-L . HA is absorbed by selective platelet permeable so it can enter the alpha granule and cause GF release. Hu et al., showed that P-selectin expression increased dramatically after PRP interacted with biomacromolecule complex (HA collagen (I)/chitosan) films. HA which bound to CD44 caused an increase in mitogen-activated protein (MAP) kinase and increased the TGF-β receptor to lipid association, which facilitated an elevated receptor turnover and attenuation of TGF-β1-dependent changes in proximal tubular cell function . Further investigation is required to explain the mechanism for increasing GF levels. Fibrin tissue is formed by fibrinogen conversion. Different fibrin diameters, mass/length ratios, density, porosity, and permeability of fibrin tissue can alter cell adhesion and migration. Perez et al., found that different PRP preparations made different fibrin networks . In the study by Lio et al., small fibrin clots were observed in the HA group compared to other groups. Viscosuplement with HA inhibited platelet aggregation and affected GF release . These results can be applied to the clinical application of a mixture of PRP and HA which may be more effective than PRP or HA alone for certain tissues. In this study, it was found that GF levels in PRF-L increased in their mixtures with HA crosslinking. GF levels in PRF-L would be increased in HA with the lowest crosslinking level of 3%, and decreased with increasing crosslinking degree of HA. This was due to the ability of HA to trigger the release of GF from platelet granules, and the ability of HA to absorb water content in PRF-L so that the lower the crosslinking degree of HA produced more absorbed water content; this yielded an increase in GF levels in PRF-L .
With this increased crosslinking of HA, the viscosity and durability of HA tend to be more persistent. But the increase in HA crosslinking that exceeds a certain point or excessive can cause biocompatibility and produce foreign reactions in the body. In a recent study, it was found that cytocompatibility was very dependent on the type and concentration of crosslinkers and on the composition of solvents . The higher concentration of crosslinker used, the more rigid the hydrogel properties of HA would be produced, followed by the lower ratio of swelling when injected into the skin . The optimal degree of crosslinking today has not been identified. A very high degree of crosslinking reduced the ability of water to bind HA and therefore, increased the volume of tissue. Very high crosslinking degrees were reported to potentially affect filler biocompatibility and could cause rejection or encapsulation [3,4]. 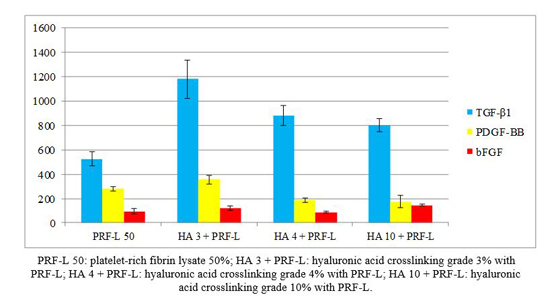 This was consistent with the results of this study where the GF content of PRF-L showed the highest number in HA mixtures with the lowest crosslinking degree (3%), this may be due to the ability of water withdrawal from PRF-L with low HA crosslinking degree, greater than HA with high crosslinking degree. Study by Lio et al., proved that HA could increase the release of TGF-β1 and PDGF-AA from PRP on day 5 . The limitation of this study was the examined GF were only three out of many potential GF. TGF-β1, PDGF-BB and bFGF were selected for analysis due to being the most important growth factors of fibroblasts in the aging skin. This study was conducted using lysates from PRF due to its practicality, with no requirement of additional substances such as PRP, and more GF production than PRP. A study by He et al. exhibited the effect of PRP and PRF on proliferation and differentiation of rat osteoblasts. Quantitative differences in GF and cytokines were observed in different procedures of platelet products. The PRP released the highest number of TGF-β1 and PDGF-AB on the first day, followed by the release which decreased significantly at next time point. PRF released the highest number of TGF-β1 on day 14 and the highest number of PDGF-AB on day 7. PRF released the autologic growth factor gradually and showed stronger and more durable effect on the proliferation and differentiation of mouse osteoblasts than PRP . In PRF, the isolated platelets were active platelets, and therefore, the GF content in the PRF lysate was higher even though the release took place more slowly. Platelet activation through the stimulated thrombin causes greater release of GF in fibroblast growth. Procedures of PRP yield better release of PDGF and Chemokine (C-C motif) Ligand 5 (CCL5), with the possible mechanim was platelet degranulation facilitated through the higher enrichment in platelets following the preparation and the activation with thrombin and calcium. Meanwhile, procedures of PRF efficiently yield the bFGF, vascular endothelial growth factor (VEGF), TGF-β1, and cytokines, derived from leukocytes and circulating progenitor cells adhered to the clot of fibrin [18-19]. Low degree HA crosslinking elevated all GF levels of TGF-β1, PDGF-BB, and bFGF in PRF-L. The lower HA crosslinking degree provoked higher release of GF in PRF-L.
Duffy AM, Bouchier-Hayes DJ, Harmey JH. Vascular Endothelial Growth Factor (VEGF) and Its Role in Non-Endothelial Cells: Autocrine Signalling by VEGF. Madame Curie Bioscience Database. 2017. Goldman A, Wollina U. Facial rejuvenation for middle‑aged women: a combined approach with minimally invasive procedures. Clin Interv Aging. 2010. 5: 293–9. Fallacara A, Manfredini S, Durini E, Vertuani S. Hyaloronic Acid fillers in soft tissue Regeneration. Facial Plast Surg. 2017. 33(1); 87-96. Beasley KL, Weiss MA, Weiss RA. Hyaluronic Acid Fillers: A Comprehensive Review. Facial plastic surgery. 2009. 25(2): 086-94. Dohan DM, Choukroun J, Diss A, Dohan SL, Dohan AJ, Mouhyi J, Gogly B. Platelet‑rich fibrin (PRF): a second‑generation platelet concentrate. Part III: leucocyte activation: a new feature for platelet concentrates? Oral Surg Oral Med Oral Pathol Oral Radiol Endod. 2006. 101(3): e51–e55. Dohan DM, De Peppo GM, Doglioli P, Sammartino G. Slow release of growth factors and thrombospondin‑1 in Choukroun’s platelet‑rich fibrin (PRF): a gold standard to achieve for all surgical platelet concentrates technologies. Growth Factors. 2009. 27(1):63–9. Wirohadidjojo YW, Budiyanto A, Soebono H. Platelet-Rich Fibrin Lysate Can Ameliorate Dysfunction of Chronically UVA-Irradiated Human Dermal Fibroblasts. Yonsei Med J. 2016. 57(5): 1282-5. Shimojo AAM, Pires A, Lichy R, Santana M. The Performance of Crosslinking with Divinyl Sulfone as Controlled by the Interplay Between the Chemical Modification and Conformation of Hyaluronic Acid. J Braz Chem Soc. 2015. 26 (3). Jones D. Hyaloronic Acids: Basic Science. Injectable Fillers: Principle and Practice. Willey-Balckwell; 2010. p: 19-25. Lio K., Furukawa KI., Tsuda E., Yamamoto Y., Maeda S., Naraoka T., Kimura Y., Ishibashi Y. Hyaloronic acid induces the release of growth factors from platelet rich plasma. Asia Pac J Sports Med Arthrosc Rehabil Technol. 2016; 4: 27-32. Anderegg U, Simon JC, Averbeck M. More than just a filler – the role of hyaluronan for skin homeostasis. Experimental Dermatology. 2014. 23(5): 295-303. Kang RS, Lee MK, Seth R, Keller GS. Platelet-Rich Plasma in Cosmetic Surgery. Int J Otorhinolaryngol Clin. 2013. 5(1): 24-29. Azyenela R, Julianto I, Wirohadidjojo YW. The Addition of Hyaluronic Acid into Platelet-Rich Fibrin Lysate in Restoration of Senescent Human Dermal Fibroblasts Activities. Malays J Med Biol Res. 2016; 3(2). Frelinger AL 3rd, Torres AS, Caiafa A, Morton CA, Berny-Lang MA, Gerrits AJ, Carmichael SL, Neculaes VB, Michelson AD. Platelet-rich plasma stimulated by pulse electric fields: platelet activation, procoagulant markers, growth factor release and cell proliferation. Platelets. 2016; 27(2): 128-35. Hu Y, Wu Y, Cai J, Ma S, Wang X. The procoagulant properties of hyaluronic acid-collagen (I)/chitosan complex film. J Biomater Sci Plym Ed. 2009; 20(7-8): 1111-8. Perez AG, Rodrigues AA, Luzo AC, Lana JF. Fibrin network architectures in pure platelet-rich plasma as characterized by fiber radius and correlated with clotting time. J Mater Sci Mater Med. 2014; 25(8): 1967-77. Yang D, Wang W, Li L, Peng Y, Chen P, Huang H, Guo Y, Xia X, Wang Y, Wang H, Wang WE, Zeng C. The relative contribution of paracine effect versus direct differentiation on adipose-derived stem cell transplantation mediated cardiac repair. PLoS One. 2013;8(3):e59020. He L, Lin Y, Hu X, Zhang Y, Wu H. A comparative study of platelet rich fibrin (PRF) and platelet rich plasma (PRP) on the effect of proliferation and differentiation of rat osteoblasts in vitro. Oral Surg Oral Med Oral Pathol Oral Radiol Endod. 2009. 108(5): 707-13. Passaretti F, Tia M, D'Esposito V, De Pascale M, Del Corso M, Sepulveres R, Liguoro D, Valentino R, Beguinot F, Formisano P, Sammartino G. Growth-promoting action and growth factor release by different platelet derivatives. Platelets.2014;25(4):252-6.